As with many of everyday life-happenings, the ‘self-care’ trope has been adopted by the world of social media. A hashtag or youtube search yields hundreds of pictures and videos of beautifully groomed young women narrating their self-care routines and providing techniques. Activities range from physical grooming, self-reflective, and mindfulness practices to tips to prepare for times of emotional stress. The commodification of this phenomenon is a clear trend. Beauty and health products are flaunted and strategically placed alongside luxurious bath situations, with particularly well-sponsored collaborations generating a couple of minutes worth of product description or perhaps just a quick mention. While one may feel slightly peeved at the not-so-subtle advertising, which seems to target you wherever you look, these posts are certainly a good place to check-in with the latest health food trends, probably of the blended matcha variety. Post-pampering, suggestions include spending time re-organizing your space, comfort reading or series watching, going for a refreshing outdoor walk or dancing in your room ‘like no-one is watching,’ this particular video racked up over 200 000 views. The social media frenzy around this topic raises questions about the authenticity of what it actually means to care for the self. As Feminarchy, a YouTube parody duo comment in their ‘Self-Care’ titled video, “self-care isn’t actually about feeling good, its about making it digitally understood.” Other parodies of the trope suggest that self-care has taken on an all-encompassing meaning and its application can provide an excuse for more outrageous activities - like eating ’13 glazed donuts instead of a salad’ or not paying your taxes but rather putting that money towards spa-days. Along the same vein, we are constantly being advised on ‘what to eat in a day,’ the ultimate skin-care routines and the best fitness regimes to care for our bodies. Of course, this self-care advice rests on the age-old presumption that ensuring a slim figure and maintaining perfectly clear skin should be the ideal goals of every women. What is refreshing though, is that many of these social media self-care routines are not only physically focused, but encourage self-reflection and remind us to spend time focusing on our emotional and mental well-being. A good portion of the ‘self-care’ titled videos speak to mindset changes or advise on small daily practices that can help to reset your mental state at the beginning or end of a busy day. These may include journalling or free-writing, meditation or a mindful yoga session. While being told to spend time disconnected from social media and technology by the Youtuber you are currently watching on your phone is somewhat ironic, the messages conveyed are valuable and clearly ring true with a large audience. These types of videos garner huge levels of engagement and hundreds of people comment about how helpful and inspiring they find the advice shared. Some of the self-care videos that I came across speak to more serious issues around mental health and how to prepare for or deal with anxiety attacks, depression or the effects of severe stress. In fact, a trending theme in self-care 101 is preparing a ‘self-care emergency kit’ complete with ‘self-compassion worksheets,’ affirmation letters written to yourself, meditation tracks, and easy to prepare nutritious food. Social media provides a wealth of ideas for what should go into such a kit as well as pointers on small steps to take when you feel a bout of anxiety approaching. The idea is to create a pre-prepared kit filled with tools and goodies to help you feel better and get out of a negative space. Self-care boxes have (unsurprisingly) joined the ranks of the subscription box empire but curating your own unique kit is more likely to cater to your specific needs and be of help in times of emergency. What is perhaps most valuable about this social media trend is the space that it creates for discussion around these issues. In a world where mental illness has for so long been misunderstood, the fact that mainstream social media spaces are creating content around dealing with its effects signals an important shift. In opening these debates, women are reminded that they are not alone and belong to a wider community of people who may experience similar symptoms. Self-care has certainly proven to be a fertile topic for content creation but if you are not into watching other women’s carefully edited scrubbing, cleansing and eating routines, you may be more inclined towards the self-affirming, self-reflective side of the self-care phenomenon. On this side of the self-care spectrum, we have seen a parallel rise in the movement towards body positivity and an emphasis on embracing every aspects of oneself rather than encouraging efforts to change. 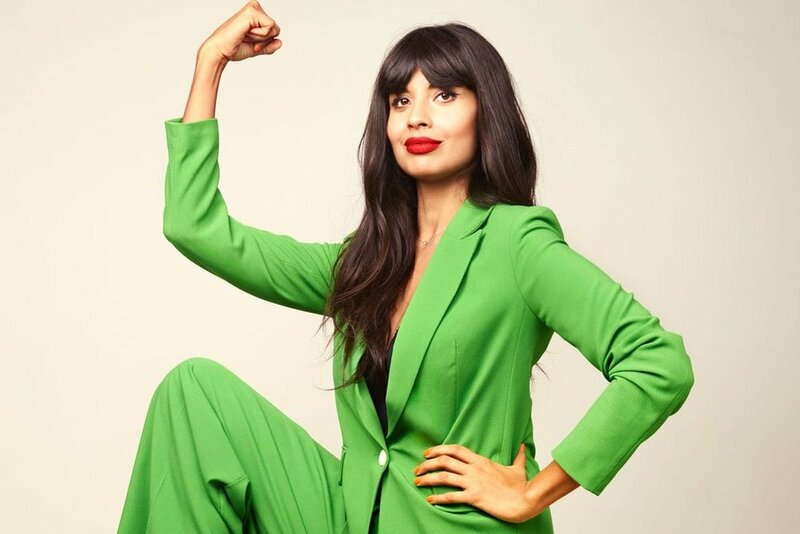 In her ‘I Weigh’ campaign, Jameela Jamil has started the latest wave of self-care revelations and the campaign is helping to re-orientate the social media space in line with body positive rhetoric. Jamil, a former British (Channel 4) television presenter turned star of NBC’s hit comedy, ‘The Good Place,’ has found her place amongst the social media influencers on the crusade for women’s rights. The story goes that after seeing a picture of the Kardashian clan featuring the weight of each of the six women, Jamil saw the need to change the narrative of what ‘weighs’ as important. In a selfie posted on Instagram, Jamil lists all the important things that make up her being, including a ‘lovely relationship,’ ‘great friendships,’ being financially independent and speaking out for women’s rights. The campaign reminds us to focus on the aspects of ourselves that are valuable and challenges women to rethink their obsession with weight and body conformity, using the hashtag #fuckingkg. In its essence, the campaign is about self care, where women have come together around an idea to not only identify and reflect on their amazing qualities but also to embrace those qualities that society has consistently deemed undesirable such as ‘bingo wings.’ This kind of self-reflective self-care plays an important role in our social media obsessed society where ‘ideal’ body-types prevail, and young women with millions of followers and seemingly glamorous lives often (mis)guide us in our self-care journeys online. The ‘I Weigh’ campaign joins an ever-expanding movement, which equates self-care to self-love. A quick scroll of the instagram handle @i_weigh shows hundreds of beautiful posts of women joining the conversation about reclaiming their right to celebrate themselves - all of themselves. It is not clear-cut what self-care actually entails and how we go about practicing it. Rather, it comes down to a personal interpretation of what one feels is the best way to make herself feel good. So yes, while it does feel good to smear a clay mask all over your face every now and then, it is my opinion that the real care comes from finding the love of self and the space to celebrate it. As a first time curator, I had no clue where to start, but I knew I wanted the art show to be meaningful and representative of the fight I had undertaken as the founder at Openletr, shedding light onto women, creating equal representation, inclusion and diversity. So, I started looking for inspiration within my own space, and stumbled upon a poem I had shared on December 24th 2015. A few months ago, I spontaneously chopped my relaxed hair off, but prior the chop, I kept wishing I had enough guts to own my African roots. And I have to admit the emotional courage it takes to be vulnerable. For the first time, I realized how much pressure black women undergo in their quests to create equal representation even when the choice promotes a healthy lifestyle. As with many of everyday life-happenings, the ‘self-care’ trope has been adopted by the world of social media. A hashtag or youtube search yields hundreds of pictures and videos of beautifully groomed young women narrating their self-care routines and providing techniques. Activities range from physical grooming, self-reflective, and mindfulness practices to tips to prepare for times of emotional stress. The commodification of this phenomenon is a clear trend.